After the success of the last three slim fitting trousers, I wanted to continue experimenting with styles and silhouettes. 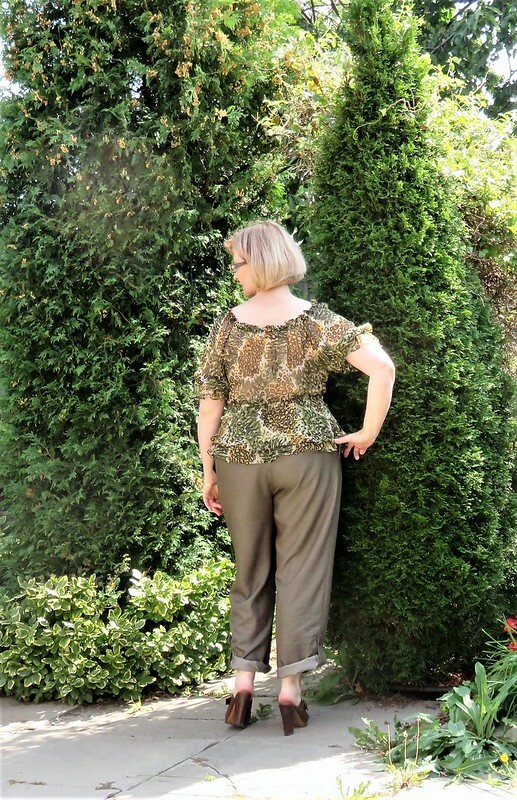 My bottom half is quite firmly in the Burda Plus range, unless I want to adjust patterns excessively (which I cannot be bothered to do unless severely pressed), so I thought I would trace off this little gem from Burda 8-2011-136 and see how it went. I don’t always like the way Burda styles curvy women – the proportions are all wrong and the fit is always 1,000,000,000 miles off of anything a self-respecting woman with curves would want to wear, in my not-so-humble opinion. But I was curious to see what some of the styles they put out in the plus range looked like on someone like me i.e. not young and statuesque. I chose to make this pair out of tencel denim from EOS. 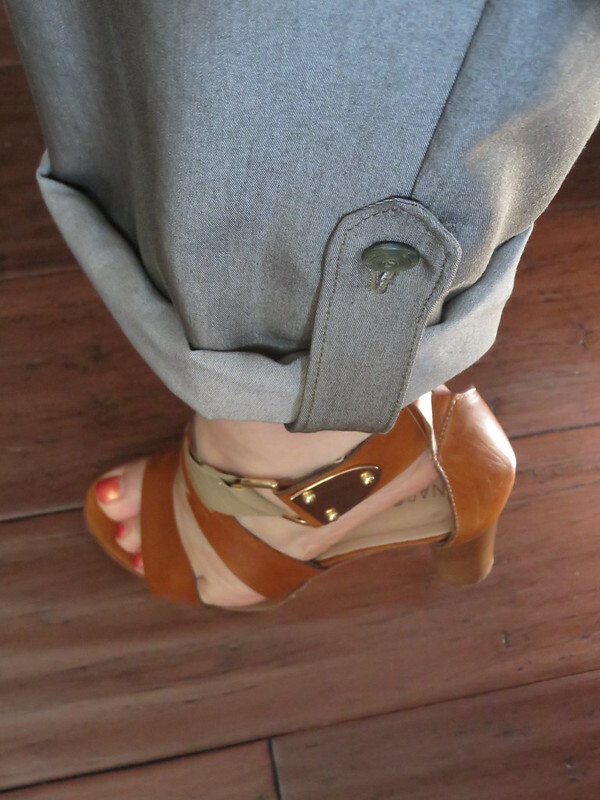 I had some misgivings about making trousers from the fabric, as it’s quite drapey, and my previous experience of anything tencel or rayon includes horrible wrinkling and pilling. But this is a medium-weight poly-rayon-elastene blend, tightly woven, and although I’ve been wearing the trousers all morning, you can see the fabric doesn’t really hold onto the wrinkles, thanks to the polyester, I’m sure. I’m not completely comfortable with the style of these trousers on me. They are a rather loose fit, and I sometimes feel like they are too loose while I’m wearing them, but they look as though they fit well enough in the photos. Opinions? You can see the top of a tank top made from silk jersey at the neckline. I’m planning a post on that top shortly. And me rolling up the hems for the next set of pictures…. And what they look like with the tabs doing their job. The top is Vogue 1245. The front crotch depth is very long – I even shortened it as per my usual pattern adjustments – but check out this action shot. I noticed in the Burda magazine photo there doesn’t seem to be so much length on the model, so I really don’t know what happened. I love the details on the back. 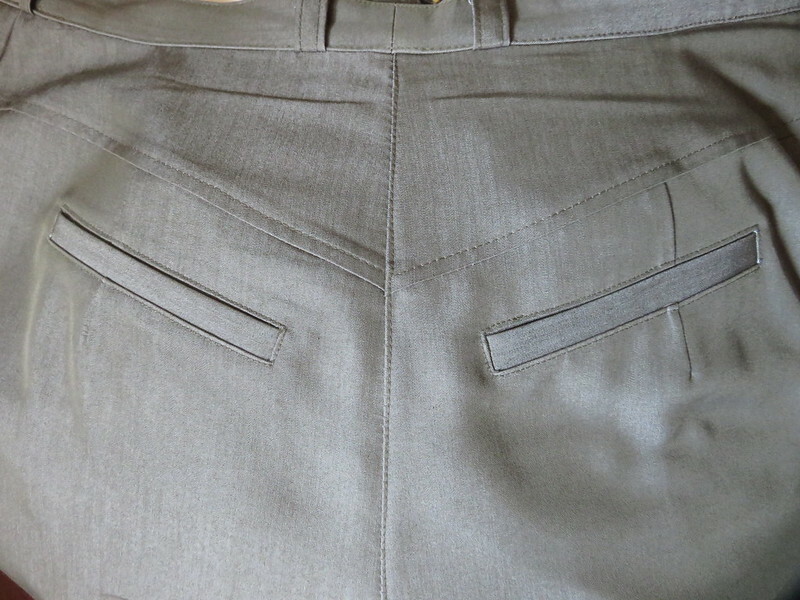 I left of the superfluous centre back waistband button tab. I just couldn’t see the point. The pockets are faux, as I didn’t want the bulk of the pocket bags on my backside. And a close up of the hemline tabs. Well, whatever the fashion police verdict on these trousers is, they’re in my wardrobe, and I’ve been wearing them quite happily. I’m pleasantly surprised at how many random pieces in my closet actually work quite nicely with them. How about you? Taken a style risk lately? Did you ever Review Vogue 1093? I’d love to know if you made modifications and which one and how. It Looks so well made! Y’know, I never did do a review. It’s actually a wearable muslin, made of cheap stretch cotton twill without any adjustments. I do remember making a straight size according to my bust, which I already knew wouldn’t fit perfectly since I need an FBA. But I can tell you if I were to make it again, I would cut the smaller size to fit my shoulders properly, do an FBA and grade up a size below the waist. The armholes sit very low, and the front is low, so I’m only comfortable wearing it with a tank or camisole underneath. Ow thank you for your swift reply! 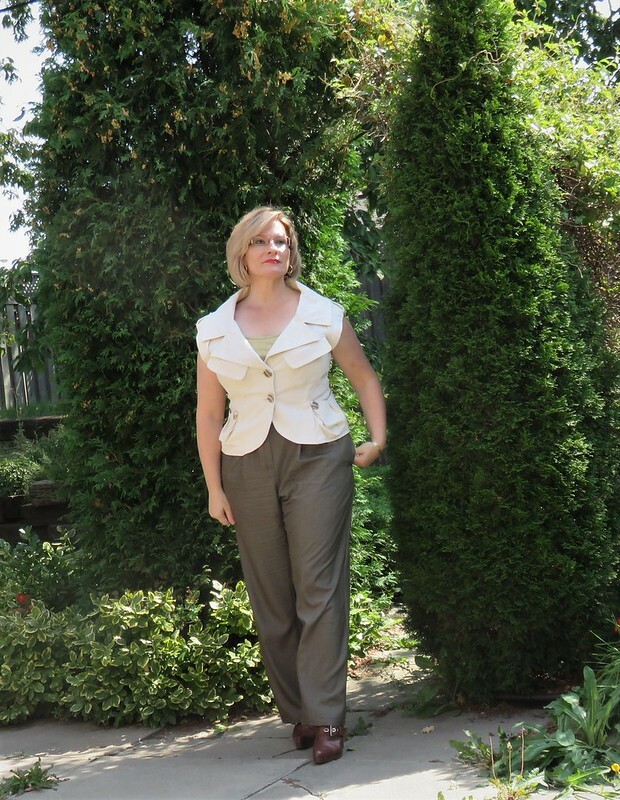 I like that style and your sewing, the faux pockets, everything looks so perfect! I agree 1000% with you on the styling and fit of the Burda Plus size stuff, a major factor that turns me off immediately when I’m looking through the magazine! However, I like these pants on you. The looser, floppy fit is fine with the fabric you’ve chosen. In something with more body, you’d probably want to take them in. If you’re comfy wearing them, then they’re a winner! Loving the first jacket/top, very, very cool!! I really like the pants with the olive tones print, I think chiffon? Kind of reminds me of the Alice + Olivia top from a couple years back. 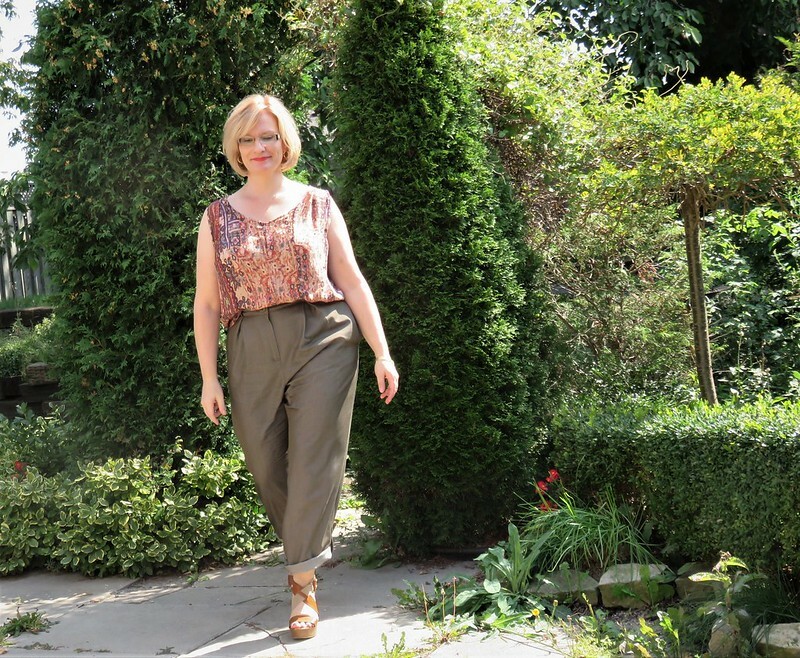 beautifully made trousers, they look good on you and the fabric is a great choice. I like the fit as it is, although in a firmer fabric it might be different. Photos can be misleading though so I say go with what makes you comfortable. The colour is great on you. Nice fabric and colour pants but agree they seem a bit loose- would look better being a bit trimmer. They look the best with the tonal print top V1245 and the eyelet blouse. I am not sure whether you would want to adjust the fit on these with firmer fabric, but this fabric is so drapey that I don’t see a problem with the fit. I like them. They look good. And you should wear that vest often. It’s terrific. I agree, I am in love with that vest. Please wear it more often and with confidence. It looks beautiful on you Tia! I think all of your tops are wonderful with the pants!!! When I saw you roll them up I wondered how the drapey tencel would work with cuffs. At any rate, awesome pants and awesome stitching! !